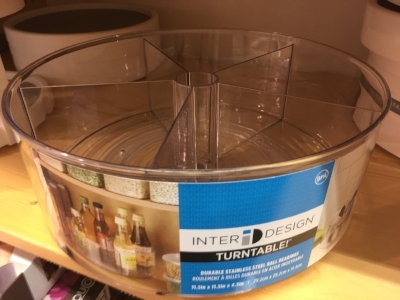 I dislike the name, but a "lazy susan" can be a great organizing tool. Tall items, though, would often fall over when the turntable spins. Now an updated version solves that issue. With taller sides and divided sections, this lazy susan keeps items standing in place. Bonus: it's clear so you can see exactly what it holds. This would be perfect for holding oils and vinegars on a kitchen counter or in a cabinet, or in the bathroom it can hold shampoo and other bottles.